One farming initiative that is pointing the way to improving crop performance and farm viability is the Yield Enhancement Network (YEN). It is showing what is possible with winter wheat yields, and how to achieve them. YEN has proved to be a winning formula for Shropshire grower Andrew Williamson, of Overton, near Bridgnorth, although no silverware sits on top of the mantelpiece. Soils are a limiting factor for competing for top yields, but that doesn’t stop him being a willing participant. What’s more important for him is learning from it. His goal is to lift rolling winter wheat averages from nine tonnes/hectare to 10t/ha, and recent results suggest the business is heading that way. His first entry was submitted in 2016 through Bayer sponsorship. With a yield of 9.7t/ha he was ranked 59th out of 86, but rather than get despondent he analysed the results to look for possible improvements. What was clear from the YEN analysis was the link between biomass, ears/m² and yield. Mr Williamson went to work. Before YEN he had not given much thought to this area. Now it is the starting block for crop managment, with the goal of 25,000 grains/m² come harvest. “If I can do that and reach a TGW of 50 then it will equate to 12.5t/ha. But to do that I’ve got to achieve ear numbers in the 500/m² mark,” he says. Two key changes ensued. With varying levels of sand, silt and clay soils it is fair to say Mr Williamson has highly variable soils, so some years ago he set out with variable seed rates. But the key change was to nutrition strategy. Generally the total dose of nitrogen has not changed - around 220 kg/n/ha. What has is the balance. Now rather than a first dressing of 40 kg/N/ha, it is more likely to be 70-80 kg/N/ha. That is followed up by three further splits, ideally three weeks apart. Mr Williamson has moved beyond the traditional three-split approach to four or possibly more. The aim is to ensure nutrients are available to the plant throughout the growing season. It also helps with sulphur applications and reducing leaching early in the season. “In the past sulphur was part of the first dressing but it doesn’t necessarily complement N application,” he says. The changes appear to be working. His 2018 entry achieved 11.5t/ha putting him in the top quarter, the highest western region result. He achieved this without any real increase in seed numbers. His field of Siskin was variably drilled between 105-195 kg/ha to produce a more even plant stand. “If I am to achieve my goal of a 10t/ha rolling average it’s not so much about improving the best performing parts of the field, but the poorer ones. Adjusting seed rates to soil conditions means our first biomass measurements in early spring showed we already had decent uniformity. Interestingly some of our highest biomass measurements were taken from the areas drilled with the lowest seed rates. The importance of correct seed rate is something he picked up as part of a New Zealand study tour. “Down under they are getting record yields with low seed numbers. Climate and irrigation is a factor but it isn’t the entire story. “By GS31 we are looking for 800 tillers/m². Excessive seed rates will only lead to more tillers and greater biomass and the danger the crop will go over. Too low and you’ll not get the tillers you need for 500 ears/m². That might lead to bigger heads but it doesn’t compensate for the lack of ears and we won’t reach our target of 25,000 grains/m²,” he notes. To improve things further last season Mr Williamson tried an amino acid biostimulant – with three applications from GS30 to GS39. It is work in progress and he will investigate further this season. However, initial results are promising. “The field certainly appeared to hold on to green leaf area and there was less septoria,” he says. But there are downsides which include the risk of the crop falling over and a higher septoria threat. To keep it standing he has beefed up his PGR programme, so that alongside chlormequat he typically adds Moddus (trinexapac-ethyl) or Terpal (ethephon + mepiquat). T1 choices will vary but Aviator (bixafen + prothioconazole) is a popular choice. “There are options when it comes to Septoria control. But we have to be mindful of resistance and Aviator comes with a good balance of azole and SDHI. It’s a very convenient option,” he adds. 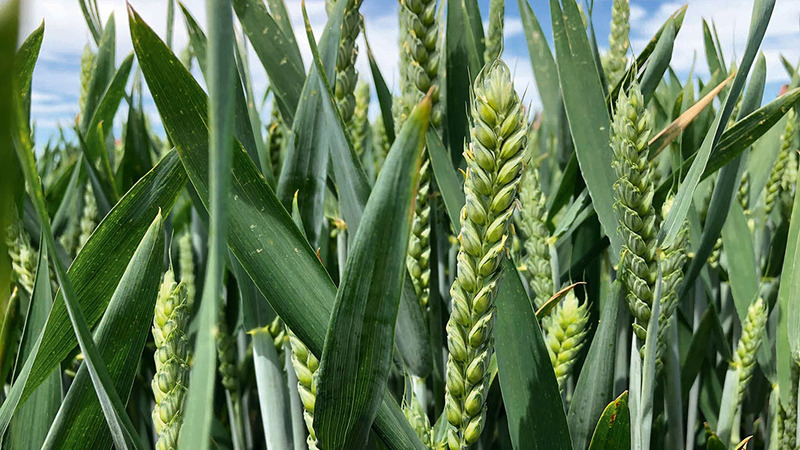 According to ADAS plant pathologist Julie Smith, crops with early biomass have higher humidity and hold on to leaf wetness for longer, increasing disease severity throughout the season. “Septoria spreads up the plant via rainsplash. But horizontal transfer is increased in thicker canopies via leaf-to-leaf contact with neighbouring plants,” she comments. But the threat isn’t just septoria. “Yellow rust spores are particularly sticky so will easily spread in thicker canopies. Maintaining green canopy area during the grain fill period is critical for yield optimisation so a robust disease management strategy is essential to protect post-anthesis source capacity,” she adds. Roger Sylvester-Bradley of ADAS says YEN has demonstrated that winter wheat yield improvements are possible nationwide. Taken as a whole, average farm yield in YEN trials is above 11t/ha and over 16t/ha has been achieved. The pattern of yield achievement across the country shows that 15t/ha is possible almost anywhere. He agrees that the first targets should be grains 500/m² ears and 25,000/m² grains and then building biomass as the final target. Other important factors in closing the gap on yield potential are soil health, row spacing and shoot size. “The evidence from YEN isn’t that growers need to spend more but to target spend better. YEN has shown small changes can help. Narrower rows can decrease plant competition while greater shoot numbers and size increases stem sugars helping offset stress factors such as drought.